Well, some exciting stuff happened around here this September, one of them being JJ started Preschool! He goes Monday-Wednesday-Friday for two-and-a-half hours in the morning, and he's been loving it! I'm so glad! I was a little nervous for him to be in a totally new environment, with no one else that he knows (a typical Mom worry, I'm sure), but he has made the transition so smoothly. The first morning when I dropped him off, he barely even noticed that I left, he was so busy exploring the classroom. Meanwhile, I was the one with tears in my eyes! Haha! 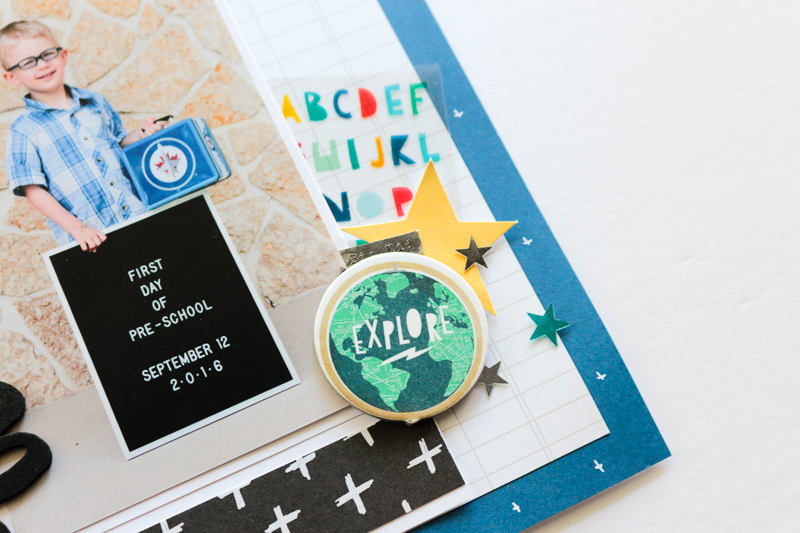 Of course, I had to make a scrapbook page for such a momentous occasion! 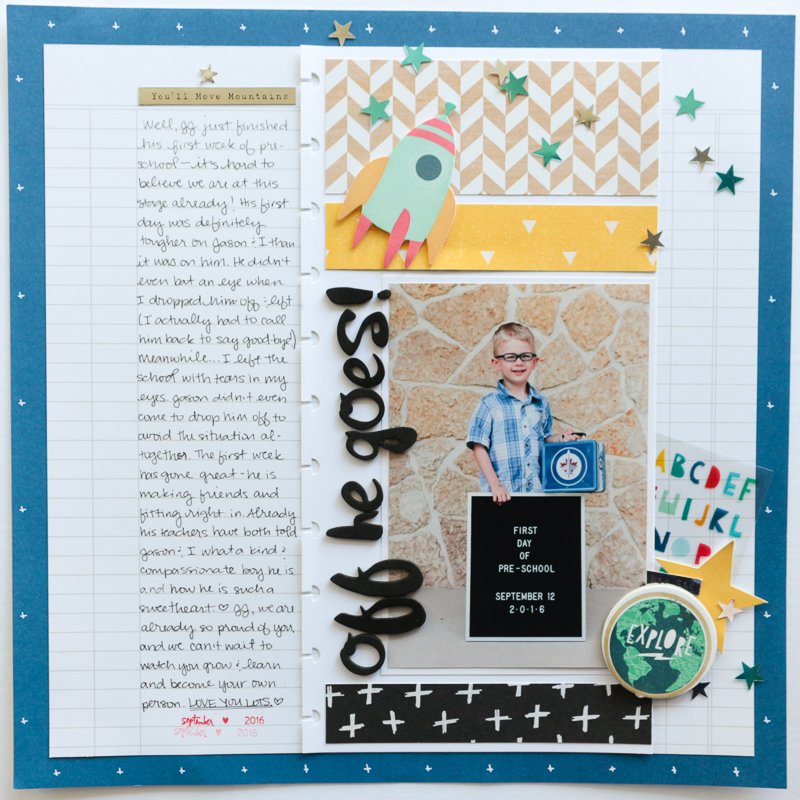 I used a sketch from Crafty Jen Schow and Tracie Claiborne's Ready Sketch Go Vol. 1 class to get started. I've realized lately how useful sketches are for me in my scrapping process. I've been having much more success and been able to get my pages done quicker (which is relative.... I am still an incredibly slow scrapper!) since I've begun starting out with a sketch. 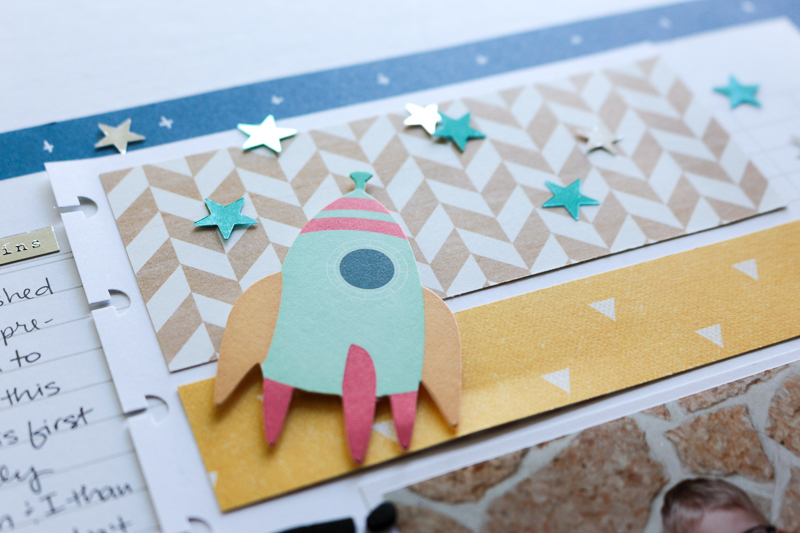 I mostly used Crate Paper's Cool Kid collection for this page, just adding in a paper from Elle's Studio's Sunny Days collection as a background, and some Thickers that have been in my stash forever. Full disclosure... I had to re-take this 'First day of school' picture three times, because apparently I cannot spell the word September for the life of me. I was so happy to have gotten a really cute picture as he went off to his first day of school, only to find once I looked back at the pictures, that I had spelled it "Septmeber". Ugh. So I 'fixed' it, re-took the photo.... went to the edit them, and then noticed that I had spelled it "Septmber" this time! Finally, third time was a charm, and I was able to spell the word correctly (!!! ), and get a cute picture to boot. Oh boy... Can you say 'mom brain'?? Anyways, I'm so happy with how this page turned out, and that it finally got me back in a scrapping mood again! I'll be back in a few days to share another layout!